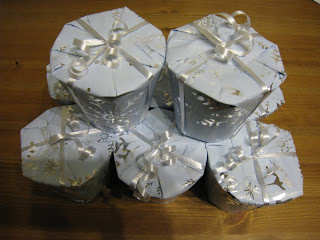 Jess gets crafty: A late Ho ho ho! Ho ho ho, Merry Christmas and a Happy New Year to all my readers! Due to all the annual Christmas madness I've been very late in writing my roughly weekly posts which is a shame as I have lots of craftiness to share with you. Now that Christmas is done for another year I can show you some of the things I had been busy working on but had to keep secret. First off are my Christmas cards of which I managed to make about 25 this year (not enough for everyone but it's a start). With a quick embossing lesson from my sister in law I was happy to find that embossing is a lovely and quick way to make some very attractive cards. The trees on my cards are simply two stamped trees which have had the embossing powder sprinkled over them and then heated with a handy heating tool (a bit like a mini hair dryer) which gives a slightly raised surface and a bit of added shimmer from the glitter in the powder. 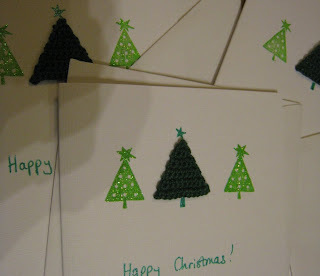 The middle tree is a simple triangle crocheted from green thread and glued on with a star and trunk added in afterwards with green pen. 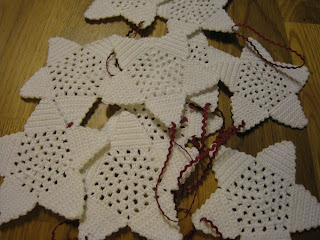 To go in my cards I made a batch of crochet star Christmas tree decorations - over 30 of them in fact, and these little lovely stars almost killed me. Though simple to make with a basic granny style hexagon as the centre and 5 triangles coming out from each side to make the points they each took about 1 and a half hours to make up, just weaving in the loose ends afterwards gave me callouses on my poor fingers! Once finished these stars had a quick soak in some white glue and water mix and left flat to dry so that they became nice and stiff. I still have one candle that I kept back for myself so if I get around to it I'll give it a quick once over with my glass paints to give you an idea of how lovely they looked. 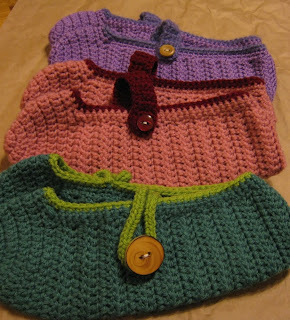 Lastly I managed to find the time to make up some more of these great crochet slippers for some of the people who had admired the pair that I made for myself recently. The pattern is simple and you end up with a very comfy slipper that seems to fit well (at least it fits me and the other lucky three recipients that got the slippers pictured). Phew! What a lot of crafting - I'm very glad that I did it but I really wished I had started much earlier as there was so much more that I wanted to make that I just didn't have the time to do. So in the spirit of making a start on some of next Christmas' crafting I've already taken down all our Christmas cards and cut them up for gift tags to go on next years presents. I'm also thinking I'll start to trying to make presents this very month so if you have any great ideas for Christmasy makes then let me know!